Having lived in Puerto Rico for three years, as a child, among other things, I grew to love Puerto Rican food, which is truly delicious. Since childhood, I have been back, spending time with my Father there, the year before he died, and traveling with Kate, where being a good sport; she drove me around the island as I went looking for everything from alcapurrias to mabi. 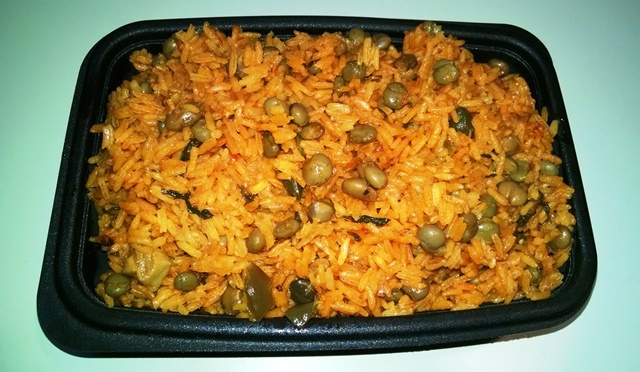 Arroz con Gandules is one of my favorite Puerto Rican dishes, and for a good long while, I had fresh gandules growing in my yard in Florida; my Mother truly loved picking and shelling the beans, and of course making Arroz con Gandules – hers was far superior to mine. In general, caned gandules have seemed a bit more expensive than other canned beans, I am not sure why, thus growing up, Arroz con Gandules was a special meal. I decided to make it for my sister Joy, who is a vegan, fearing it would not quite come out, without the chunks of ham or pork normally used in the dish; but I am happy to say it was delicious to both her and me. My recipe is not sufficiently Puerto Rican for a native, I do not use achiote, to color my rice; honestly, I barely get the color right using food coloring, I cannot imagine what I would create with achiote, but by all means use what best suites you. Also, I happen to use pork chops, that I debone and dice, when I normally make this dish, but others use diced ham or other pork; regardless of how you make, this is a dish worth trying! About 1 cup of diced Pork – I use about three pork chops, with the bone preferably; or you may use the ham listed in the Sofrito. 3 tablespoons Olive Oil – you will not add extra oil if you are using the pork chops. In a large, deep pot, add enough oil to cover the pot, heat, and place the pork chops, that have been salted, and sprinkled with pepper. You may also use pork loin, which you should dice before beginning this process, ham, or skip all together and go straight to the Sofrito, for vegan dish. Once the pork chops are browned, remove them from pot, and add the onions, while you debone the pork. Return the meat and bones to the pot to finish browning; you will remove the bones before adding the rice. After the onions are translucent, begin adding the rest of the ingredients for the Sofrito; bring the mixture to a low boil, and let it cook for about ten minutes, on very low heat. You may want to add about a half cup of water, to help all of the flavors develop, as it cooks. Add the gandules, and then the rice, giving one good stir; add the rest of the water and food coloring, bring to a boil, and then put the lid on the pot and turn down the heat to low. It will take about a half hour for the rice to become tender, and absorb the liquid. This is one of those dishes that you can top with a fried egg; if so inclined.